“The harbor was not a place people went to. Picture yourself driving on the Central Artery through Boston in 1969. You’re heading toward Quincy, zipping past a Howard Johnson’s restaurant and billboards advertising Johnnie Walker Scotch whisky, Paragon Park, and the Sheraton Motor Inn. You eventually reach Squantum and then take a helicopter ride over Boston Harbor. From the air, you get a bird’s-eye view of the gritty, industrial landscape along the city’s waterfront. You fly over Moon Island, where sewage is discharged into the harbor, and Spectacle Island, which is covered in deep layers of garbage. All of this is featured in “Boston — Harbor/City/Islands,” a 50-year-old film that shows a side of Boston that many have forgotten and proves just how far we’ve come. Larry Rosenblum, 77, was a student at the Harvard University’s Graduate School of Design when he made the film with Derek Lamb, who taught animation at Harvard, and Stanley Jacks, a professor at the Massachusetts Institute of Technology, in 1969. “It’s amazing what a time machine film can be,” he said. Rosenblum said the film was part of a study that MIT was doing on Boston Harbor. The Legislature had requested the study because officials wanted to learn more about the conditions in the harbor, he said. People didn’t pay much attention to the islands back then, he said. Spectacle Island had long been used as a garbage dump, and Moon Island was a major source of pollution. Rosenblum said the group rented a helicopter to get the sweeping aerial views of Boston and the harbor islands. When the three of them went up in the helicopter, they were taken aback by what they saw. “It was so overwhelmingly beautiful,” Rosenblum said. Shooting on 16mm film, they created a guided tour that reflected on the history of the harbor and the sorry state it was in at that time. The footage of Moon Island showed the massive granite storage tanks that were built in the 1880s to hold raw sewage that would be released into Boston Harbor. In that part of the video, the film’s narrator, Richard Basch, explains how Moon Island contributed to the pollution that plagued the harbor at the time. “These holding tanks are part of an antiquated sewage system that continues to dump raw sewage directly into the water,” Basch said. The footage of Spectacle Island shows piles of garbage covered with bits of broken glass sparkling in the sunshine. In the film, Basch explains how there are no signs of the summer hotels that once stood there in the 19th century. “Spontaneous underground fires, which continue to smolder, and a multitude of rats and seagulls are the only signs of activity on the island now,” he said. Boston Harbor has changed, too. Thanks to a multibillion-dollar cleanup project, what was once known as the “dirtiest harbor in America” has been transformed into what the EPA calls “a great American jewel.” Boston’s urban landscape has also evolved, as the elevated Central Artery that cut through the heart of the city has been replaced with an underground highway courtesy of the Big Dig project. 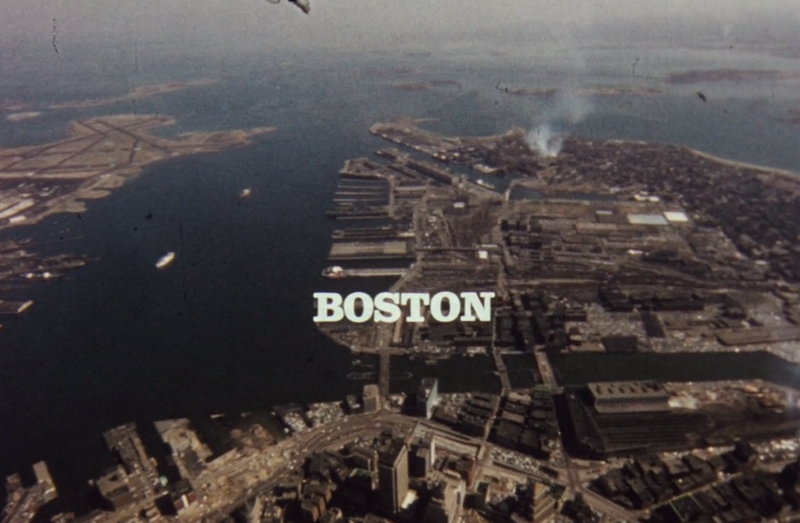 The 1969 film also features a WHDH Skyway Patrol traffic report and shots of Long Island, Thompson Island, the Prudential building, the Charlestown Navy Yard, and Logan Airport. The film was part of a collection of records from the Volunteers and Friends of the Boston Harbor Islands Inc. that was donated to the University Archives and Special Collections in the Joseph P. Healey Library at the University of Massachusetts Boston. The film resurfaced in 2016 when library officials uploaded a copy of the film so it could be viewed online. Since then, the nonprofit group Boston Harbor Now has added the film to its website, so people can see how much progress has been made in cleaning up the harbor. Boston Harbor Now officials and Rosenblum are now discussing the possibility of doing a 50th-anniversary follow-up to the original film.